Bild oben: Diese Teleaufnahme entstand nur 2 Sekunden später als die erste Aufnahme mit dem Weitwinkel, siehe Zeitstempel. Der Eselspinguin reagiert wohl gerade mit einem Warnruf auf die Anwesenheit des Weißgesichts-Scheidenschnabels! Picture above: this tele lens webcam pic was taken just 2 seconds later than the first picture (see time stamp) with the wide angle lens. The Gentoo penguin seems to react with an alarm call due to the presence of the White Sheatbill in the near reach of the nest! 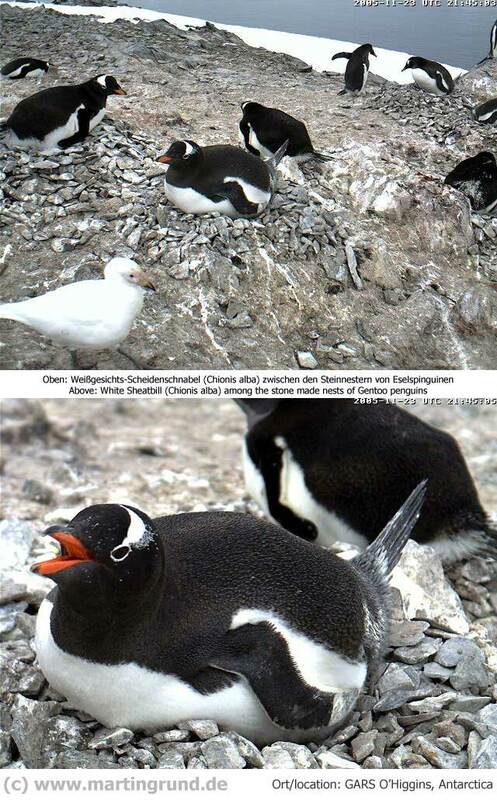 Picture above: White Sheatbill eating from extruded stomach linings or usable excrement parts of gentoo penguins. 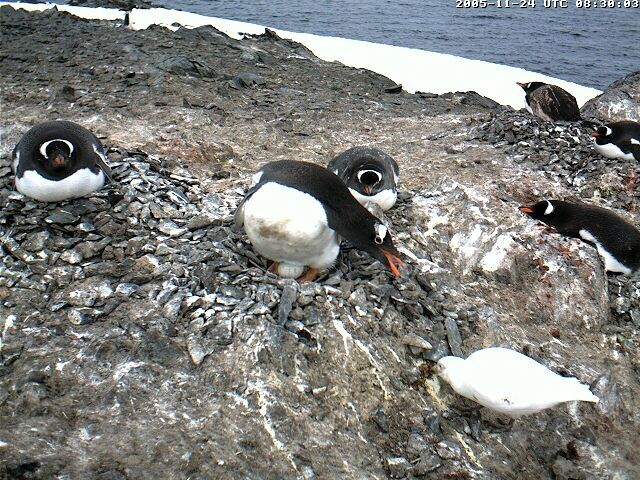 The incubating gentoo penguin reacts aggressive when this Sheatbill is in reach. White Sheatbill do not hunt on chicks or eggs like Skuas or Giant Petrels, but they take them if an adult penguin is not careful.